Winton Rovers had mixed results in 1974. The pitch was not in any condition for good football, being hard and bumpy and the players had difficulty in controlling the ball. Winton’s opening goal in the fifth minute was a long ball down the middle which broke badly for Sheridan and McIlroy had an easy task to left-foot the ball into the net. Brown in the Winton goal was having a good game and had two good saves from Balmer headers. The Winton forwards were putting in a lot of work but their finishing shots were giving Dunn no trouble. In the thirty-fourth minute, Ballmer got the equaliser when he sent in a shot from the edge of the box which Brown appeared to have covered but the ball struck Hay and ended in the corner of the net. The second half was evenly contested until the last ten minutes when the Beith forwards gave Winton a lesson on taking chances. 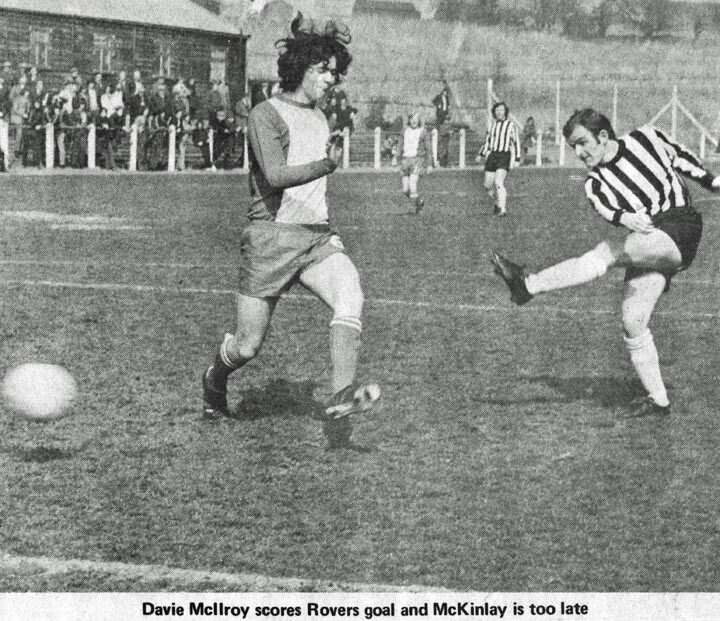 In the eithty-fourth minute, McGill took a corner on the right which came to Brown who sent a rocket shot into the roof of the net and with a minute to go, McGill hit a ball from twenty yards which Brown never saw. Best for Winton were Brown, P Clarke and McIlroy and for Beith Dunn, McKinley and Friel. Beith - Dunn; Smith, McDermid, Monan, Sheridan, McKinley, Brown, Balmer, Friel, McGill and Newman. Winton Rovers - Brown; Hay, McColl, Sanderson, P Clarke, Hankinson, Cameron, J Clarke, McIlroy, Evans and Quinn. This must rate as the best performance of Winton Rovers so far this season (on 21 September 1974). They looked a very settled and skilful side and were never in danger from Dalry who appeared off form and never really got going. Playing with the wind behind them, Winton kicked off and went straight into attack. The ball was lobbed towards goal and McIlroy was on the spot to trap the ball, dribble round the keeper and slot the ball into the net. The Dalry side, despite occasional good play from McLellan, Muirhead, Templeton and McQuade, never settled down and allowed the home side to take control of the match. The Winton defence, with Jaap and Kay in top form, looked strong. Dalry replaced Whyte with Lundy in the twenty-fourth minute. 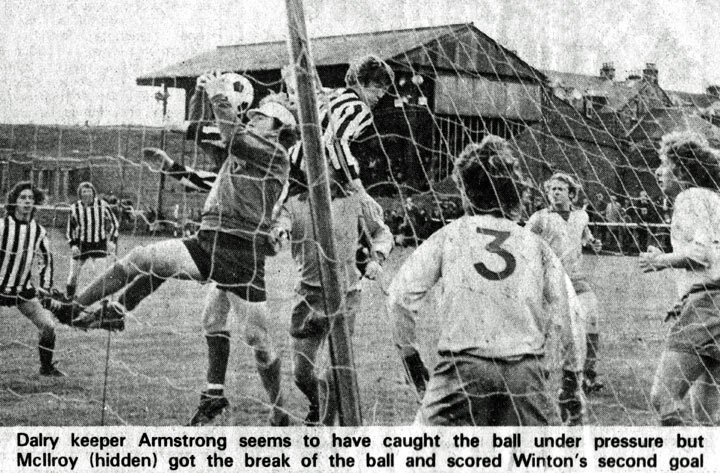 Winton began to pile on the pressure and were unlucky not to go further ahead, especially from a McIlroy thunderbolt which forced Armstrong to bring off a fine save. A twenty-sixth minute Sanderson corner found Armstrong fumbling the catch and dropping the ball. McIlroy pounced on the loose ball to put Winton further ahead. Winton should have gone three ahead soon after when McIlroy picked up the ball in midfield and lobbed the ball over the keeper. Fortunately for Dalry, Hepburn was on the line to kick the ball away. In the forty-first minute, Dalry pulled one back with a brilliant move involving all of the forward line. The ball went from man to man with Quinn putting the ball past Mooney. Soon after, a Muirhead goal was judged to be offside. McIlroy completed his hat-trick seven minutes into the second half. Sanderson took possession of the ball inside his own penalty area, slipped a pass to Doran who sprinted up the wing and sent a well-timed ball across to McIlroy. He did not hesitate in putting the ball past Armstrong. The goal of the match came two minutes later. Hay and Clarke combined well to bring the ball forward. Hay crossed from near the bye-line and McIlroy was again in position to put the ball past Armstrong. Templeton forced Mooney to bring off a good save in the sixtieth minute. However, the scoreline remained 4-1 in Winton’s favour. Dalry had another opportunity in the eighty-fourth minute when Lundy was brought down in the box by Hay. McLellan took the penalty and blasted the ball over the bar. This match showed that if Winton lose their unpredictable tag, they would be a safe bet for some honours this season. Dalry showed in patches that they too will be a side to watch this season. This was an off day for them. Winton Rovers - Mooney; Hay, Hankinson, Jaap, McColl; Sanderson, Clarke, Ellis; Doran, McIlroy and Armstrong with substitues McGlynn and Robertson. Dalry - Armstrong; McGill, Mailey; Hepburn, Miller, McLellan; Muirhead, Templeton, Quinn, McQuade and Whyte with substitutes Lundy and McPherson.